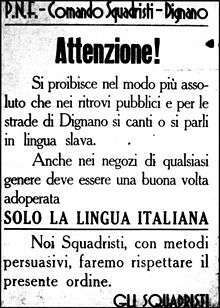 A leaflet from the period of Fascist Italianization prohibiting singing or speaking in the "Slavic language" in the streets and public places of Vodnjan. Signed by the Squadristi (blackshirts), and threatening the use of "persuasive methods" in enforcement. Italianization (Italian: Italianizzazione; Croatian: talijanizacija; Slovene: poitaljančevanje; German: Italianisierung; Greek: Ιταλοποίηση) is the spread of Italian culture, people, or language, either by integration or assimilation. It is most known for a process organized by the Kingdom of Italy to force cultural and ethnic assimilation of the native populations living in the former Austro-Hungarian territories that were transferred to Italy after World War I in exchange for Italy having joined the Triple Entente in 1915. This process was conducted during the period of Fascist rule between 1922 and 1943. Between 1922 and the beginning of World War II, the affected people were the German-speaking population of Trentino-Alto Adige, and the Slovenes and Croats in the Julian March. The program was later extended to areas annexed during World War II, affecting Slovenes in the Province of Ljubljana, and Croats in Gorski Kotar and coastal Dalmatia. The former Austrian Littoral (later renamed Julian March) was after Armistice with Austria occupied by Italian army. Following the annexation, 400 cultural, sporting (for example Sokol), youth, social and professional Slavic organisations, and libraries ("reading rooms"), three political parties, 31 newspapers and journals, and 300 co-operatives and financial institutions had been forbidden, and specifically so later with the Law on Associations (1925), the Law on Public Demonstrations (1926) and the Law on Public Order (1926), the closure of the classical lyceum in Pazin, of the high school in Voloska (1918), the closure of the 488 Slovene and Croat primary schools followed. The period of violent persecution of Slovenes in Trieste began with riots in April 13, 1920, which were organized as a retaliation for the assault on Italian occupying troops in July 11 Split incident by the local Croatian population. Many Slovene-owned shops and buildings were destroyed during the riots, which culminated when a group of Italian Fascists, led by Francesco Giunta, burned down the Narodni dom ("National House"), the community hall of Trieste's Slovenes. Benito Mussolini praised this action as a "masterpiece of the Triestine fascism"; in two years he would become prime minister of Italy. When dealing with such a race as Slavic - inferior and barbaric - we must not pursue the carrot, but the stick policy. We should not be afraid of new victims. The Italian border should run across the Brenner Pass, Monte Nevoso and the Dinaric Alps. I would say we can easily sacrifice 500,000 barbaric Slavs for 50,000 Italians. This expressed a common Fascist opinion against the Croatian and Slovene minority in the Julian March. Italian teachers were assigned to schools and the use of Croat and Slovene languages in the administration and in the courts restricted. After March 1923 these languages were prohibited in administration, and after October 1925 in law courts, as well. In 1923, in the context of the organic school reform prepared by the fascist minister Giovanni Gentile, teaching in languages different from Italian was abolished. In the Julian March this meant the end of teaching in Croatian and Slovenian. Anyway, in Šušnjevica (it: Valdarsa) the use of Istro-Rumanian language was granted since 1923. In 1926, claiming that it was restoring surnames to their original Italian form, the Italian government announced the Italianization of German, Slovene and Croat surnames. In the Province of Trieste alone, 3.000 surnames were modified and 60.000 people had their surnames amended to an Italian-sounding form. First or given names were also Italianized. Slovene and Croat societies and sporting and cultural associations had to cease every activity in line with a decision of provincial fascist secretaries dated 12 June 1927. On a specific order from the prefect of Trieste on 19 November 1928, the Edinost political society was also dissolved. Croat and Slovene financial co-operatives in Istria, which at first were absorbed by the Pula or Trieste savings banks, were gradually liquidated. In 1927, Giuseppe Cobolli Gigli, the minister for public works in fascist Italy, wrote in Gerarchia magazine, a Fascist publication, that "The Istrian muse named as Foibe those places suitable for burial of enemies of the national [Italian] characteristics of Istria". The Slovene militant anti-Fascist organization TIGR emerged in 1927. It co-ordinated the Slovene resistance against Fascist Italy until its dismantlement by the Fascist secret police in 1941. At the time, some TIGR ex-members joined the Slovene Partisans. Among the notable Slovene émigrés from Trieste were the writers Vladimir Bartol and Josip Ribičič, the legal theorist Boris Furlan, and the architect Viktor Sulčič. During World War II, Italy occupied almost all of Dalmatia, and the Italian government made stringent efforts to Italianize the region. Italian occupying forces were accused of committing war crimes in order to transform occupied territories into ethnic Italian territories. The Italian government operated concentration camps for Slavic citizens, such as Rab concentration camp and one on the island of Molat. Survivors received no compensation from Italy after the war. Mario Roatta was the commander of the 2nd Italian Army in Yugoslavia. To suppress the mounting resistance led by the Slovene partisans, he adopted tactics of "summary executions, hostage-taking, reprisals, internments and the burning of houses and villages." After the war the Yugoslav government sought unsuccessfully to have him extradited for war crimes from Spain, where he was protected by Francisco Franco. Mario Robotti issued an order in line with a directive received from Mussolini in June 1942: "I would not be opposed to all (sic) Slovenes being imprisoned and replaced by Italians. In other words, we should take steps to ensure that political and ethnic frontiers coincide." In 1919, at the time of its annexation, the southern part of Tyrol was inhabited by almost 90% German speakers. In October 1923, the use of the Italian language became mandatory (although not exclusive) on all levels of federal, provincial and local government. Regulations by the fascist authorities required that all kinds of signs and public notices had to be in Italian only. Maps, postcards and other graphic material had to show Italian place names. In September 1925, Italian became the sole permissible language in courts of law. Illegal Katakombenschulen ("Catacomb schools") were set up by the local German-speaking minority to teach children the German language. The government created incentives to encourage immigration of native Italians to the South Tyrol. Several factors limited the effects of the Italian policy, namely the adverse nature of the territory (mainly mountains and valleys of difficult access), the difficulty for the Italians from southern Italy to adapt to a completely different environment and, later on, the alliance between Germany and Italy. Under the 1939 South Tyrol Option Agreement, Adolf Hitler and Benito Mussolini determined the status of the German people living in the province. They either had to opt for emigration to Germany or stay in Italy and become fully Italianized. Because of the outbreak of World War II, this agreement was never fully implemented and most ethnic Germans remained or returned at the end of the war. In the 21st century, almost 100 years after the Italian annexation of South Tyrol, 64% of the population of South Tyrol still speak German as their first language. As soon as the fascist governor Pietro Parini had installed himself on Corfu he vigorously began a forced Italianization policy that lasted until the end of the war. The islands passed through a phase of Italianization in all areas, from their administration to their economy. Italian was designated the islands' only official language; a new currency, the Ionian drachma, was introduced with the aim to hamper trade with the rest of Greece, which was forbidden by Parini. Transportation with continental Greece was limited; in the courts, judges had to apply Italian law, and schooling followed the educational model of the Italian mainland. Greek administrative officials were replaced by Italian ones, administrative officials of non-Ionic origin were expelled, the local gendarmes were partially replaced by Italian Carabinieri, although Parini initially allowed the Greek judges to continue their work, they were ultimately replaced by an Italian Military Court based in Corfu. The "return to the Venetian order" and the italianization as pursued by Parini were even more drastic than the italianization policies elsewhere, as their aim was an forced and abrupt cessation of all cultural and historical ties with the old mother country. The only newspaper on the islands was the Italian language "Giornale del Popolo". By early 1942 pre-war politicians in the Ionian Islands began to protest Parini's harsh policies. Parini reacted by opening a concentration camp on the island of Paxi, to which two more camps were added on Othonoi and Lazaretto islands. Parini's police troops arrested about 3,500 people, which were imprisoned at these three camps.The Italianization efforts in the Ionian islands ended in September 1943, when Italy switched sides and began to back the Allies. 1 2 Sestani, Armando, ed. (10 February 2012). "Il confine orientale: una terra, molti esodi" [The Eastern Border: One Land, Multiple Exoduses]. Gli esuli istriani, dalmati e fiumani a Lucca [The Istrian, Dalmatian and Rijeka Refugees in Lucca] (in Italian). Instituto storico della Resistenca e dell'Età Contemporanea in Provincia di Lucca. pp. 12–13. ↑ Verginella, Marta (2011). "Antislavismo, razzismo di frontiera?". Aut aut (in Italian). ISBN 9788865761069. ↑ "astat info Nr. 38" (PDF). Table 1 — Declarations of which language group belong to/affiliated to — Population Census 2011. Retrieved 2012-06-12. ↑ MacGregor, Knox (1986). Mussolini Unleashed, 1939-1941: Politics and Strategy in Fascist Italy's Last War. Cambridge University Press. p. 140. ISBN 978-0521338356. ↑ Corvaja, Santi (2008). MacGregor Knox. Enigma Books. p. 170. ISBN 978-1929631421. 1 2 3 4 Commissione Italiana di Storia Militare (1993). L'Italia in Guerra - Il Terzo Anno 1942. Rome: Italian Ministry of Defense. p. 370. Retrieved 5 November 2016. ↑ Vallianatos, Markos (2014). The untold history of Greek collaboration with Nazi Germany (1941-1944). p. 74. ISBN 978-1304845795. ↑ Commissione Italiana di Storia Militare (1993). L'Italia in Guerra - Il Terzo Anno 1942. Rome: Italian Ministry of Defense. p. 370. Retrieved 5 November 2016. ↑ Rodogno, Davide (3 August 2006). Fascism's European Empire: Italian Occupation During the Second World War. Cambridge University Press. ISBN 9780521845151.